Azaleas are deciduous or evergreen shrubs admired for their prolific display of flowers and their plant forms. Although many modern azaleas are the result of complex hybridization, they remain best suited to temperate climate regions where there is a cool to cold winter dormancy and warm to hot summer. They also are sold as seasonal houseplants where non-freezing but cool temperatures prolong the retention of flowers. All azaleas botanically are rhododendrons (Rhododendron spp. ), but are further grouped into subgenera Pentanthera and Tsutsusi based on floral and foliage characteristics, among others. The common name azalea is loosely given to small-leaved shrubs that are either deciduous, losing their leaves in winter, or evergreen. Many hybrid azaleas have been developed over decades, and thus many subgroupings of azaleas exist, including deciduous types like Ghent, Mollis, and Knap Hill-Exbury hybrids as well as evergreen types like Indica, Kuruma, Satsuki or Robin Hill hybrids. It is important to understand the temperature needs and limitations for the hybrid azalea subgrouping. Often a plant tag will list the specific cultivar name of the azalea as well as the subgrouping type. For example, cultivar Gibraltar is a Knap Hill-Exbury azalea, and should be given care and conditions appropriate for that deciduous azalea subgroup. 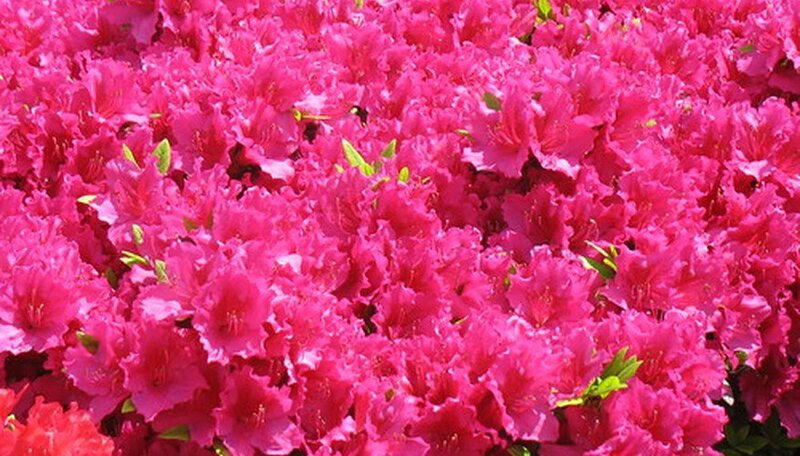 Azaleas serve both an outdoor landscape and an indoor forced-flowering houseplant purpose. Outdoors the azalea shrub brings greenery and form to woodland gardens, mixed shrub borders or foundation plantings. Certain varieties of azaleas, based on their growing characteristics, have been utilized in the florist industry as small potted gift plants that can be forced into bloom at different times of year. Temperature during the growing season and during the necessary dormancy are important for the health of the azalea plants as well as good flowering. With a tremendous number of azalea hybrids and varieties, pinpointing an exact limit on winter cold hardiness is difficult. However, generally speaking, deciduous azaleas tolerate lower winter temperatures much better than their evergreen counterparts. Northern Lights azaleas have been developed to survive in winter climates where temperatures often reach -15 to -25 degrees F. Most types, however, may only withstand winter cold to -5 to 10 degrees F, and other factors such as duration of the cold or soil moisture can contribute to the individual azalea's ability to tolerate winter cold. Without an annual period of growth followed by a dormancy with cool to cold temperatures, the azalea will not abundantly produce flowers, if at all. There are exceptions to this because of all the genetic diversity in the hybrids today, but these shrubs are not continually flowering. Excessive cold or an unseasonably late spring frost or freeze can destroy emerging leaves and flower buds, too. Conversely, azaleas are not tolerant of extended high temperatures outside of the summer. Some evergreen groups, like the Indica hybrids, are better adapted to regions with long, hot summers, but prolonged exposure to heat, that above 90 degrees F, can degrade plants. Even in the warm climate areas along the American Gulf Coast, significantly cooler fall, winter and spring temperatures prevail for consistent flowering. Azaleas are not adapted for sustained growth in tropical or subtropical climates, except where mountain elevations help create a climate that is more like that of the temperate climate zones. Whether grown outdoors in the garden or enjoyed in a flower pot on the kitchen table, azalea plants must be exposed to temperatures within the range of approximately 0 to 90 degrees F. When actively growing or in flower, the temperature range certainly must be above 32 degrees F. The cooler the temperature, the slower the growth rate. Thus, if a flower display in spring is exposed to cool temperatures, such as 40 to 50 degrees F, the blooms will last longer on the plant, extending the display. If temperatures are higher, 70 to 80 degrees F, flowers will open and fade at a faster rate. Indoor houseplant azaleas should be placed out of range of heating and air-conditioning registers so that their drying hot or cold breezes do not affect the plants. To prolong the flowering indoors, temperatures below 65 degrees F would be ideal, and keeping plants out of direct sunlight can reduce watering needs and heating of leaves and flowers.